“Are you driving extra carefully because of your new glasses?” “Do I seem like I’m driving extra carefully?” “You seem like you’re driving incredibly carefully.” His hands grip an imaginary wheel and he leans forward like Mr. Magoo. See if you can use any of this. 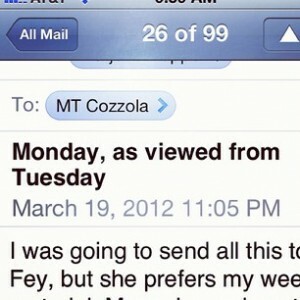 I was going to send all this to Tina Fey, but she prefers my weekend material. 1. My mom is having her bowling team friends over on Monday for lunch after they bowl. There have been multiple conversations about what she’d prepare—brunch food? Soup? Something else? The last I heard it was going to be a wild rice soup that she could prepare the night before and put in a crock pot, some warm bread, and apple bars. Simple. Delicious. Tonight my sister told me about Mom’s new plan. It seems that Mom was at Steak ‘n Shake recently. It was busy, so she sat at the counter. While there, she admired the Mexican grill guy’s spatula skills. The waiter told her this guy’s a good cook—he doesn’t just make hamburgers. Well! Apparently that’s all the recommendation my mom needed. This grill guy is coming to her house on Monday to cater her luncheon. This woman who is starting to get creeped out by staying alone at night has invited a stranger to cook for her and her friends. Tacos. Thank you for answering my questions the other day. This is a follow up to the interview for my (stupid) career planning class; we are practicing thank-you letters. It is good you like your job. I did not know that you wanted to be a comedian and piano player. It is sort of amusing how you got an internship. Lucky for all of us, the teacher gave her an F, not detention. 3. Tomorrow I’m meeting with an acquaintance who wants to hire me as a bone marrow donor recruiter. $12/hour plus mileage. Sounds like I’d travel around the state, when it was convenient, and work at bone marrow drives. Since I am She Who Can’t Say No, I said Yes. I hope I don’t get an embroidered polo shirt to wear. There’s more, but I think this did the trick. I’ve pulled away from my cute story, even the part where I make an excellent point about how people of a certain gender always seem to think people of another certain gender drive like crap. So Georgia, thanks for saving me and my loyal readers from a fate worse than death. Hope your week picks up. I think I may have been the one who dodged the blogllet. Best part of this story was Dave Belden’s reply with serious photo.